As part of our leaves unit, I wanted my kids to become familiar with both leaf parts and leaf shapes. To be honest, I *myself* needed to become familiar with leaf parts and leaf shapes as well. But the joy of homeschooling is that I get to learn right alongside my kids! In this post I’m sharing a bit of what we did to accomplish these goals, and I’ve provided links to lots of great printable resources for learning about leaves and learning with leaves. One activity we did to learn about the parts of a leaf was the Leaf Parts printable from A Teaching Mommy’s Leaves Unit pack. 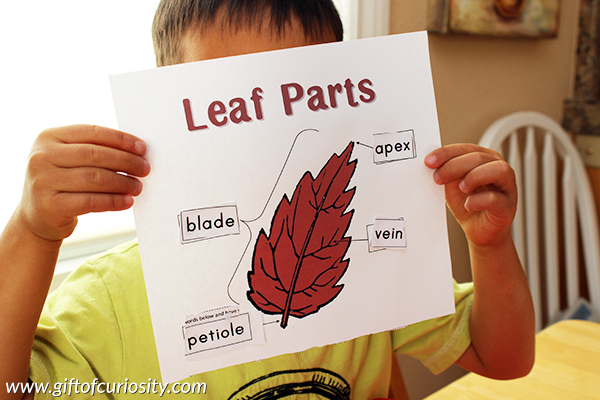 The kids cut and paste the names of the leaf parts onto the diagram. There was some serious vocabulary development going on while we did this activity! I printed out some leaf shapes 3-part cards from Montessori Helper (sorry I can’t find a link to the exact set of printables we used). 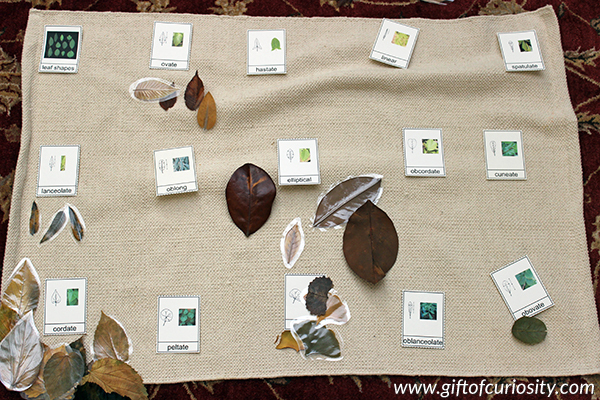 We laid them out on a small rug and discussed the different shapes of the leaves. I worked with the kids to really hone in on the images they were seeing and to describe them as richly as possible. We talked about leaves being thin vs. wide, tall vs. short, round vs. pointy vs. heart-shaped, jagged vs. smooth, etc. Then I brought in a pile of leaves we had preserved, and we worked to match them to the leaf shapes on our cards. Until we did this activity I had no idea there was such an expansive vocabulary for describing leaf shapes. Whew! On my Botany Unit Study page, I have a section devoted to all of the leaf activities we did during our leaves unit. 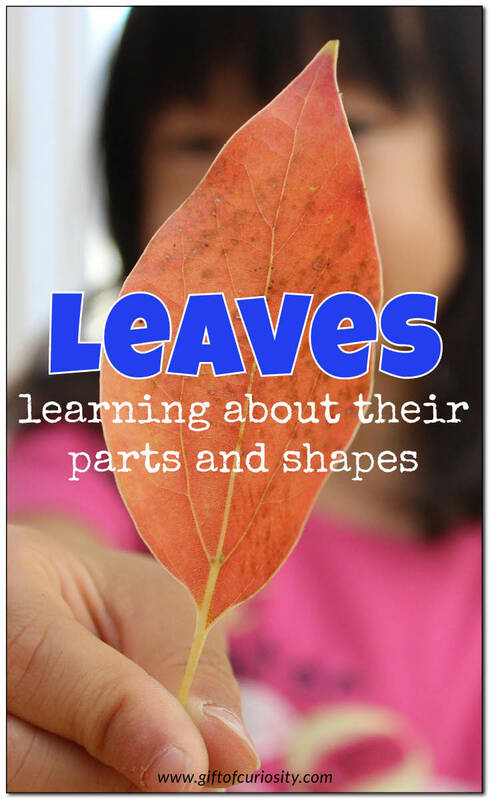 There you will find lots of great activity ideas and resources for teaching your kids about leaves. 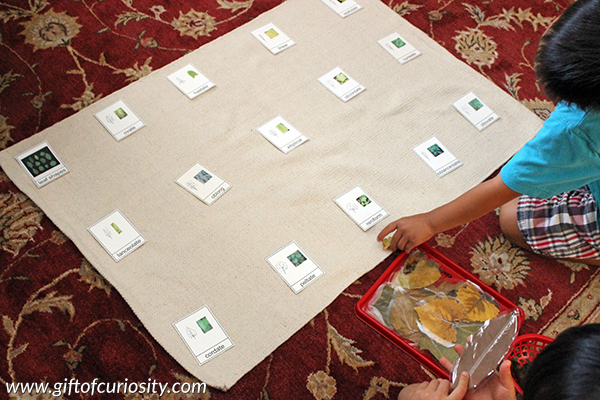 Leaf Identification flashcards from Look, We’re Learning! Thank you for providing your readers with some wonderful resources to aid in our homeschooling journey. 🙂 Pinning this! Wonderfully in-depth as usual; I will definitely be doing some of these with my kindergartener. I wanted to ask, what age are your kids now? I’m thinking some of the activities might be better for those who already know to read; am I correct? My DD is 5 1/2 and we are working on learning to read this year. I am thinking in particular of the leaf parts activity with the labels; should I wait until she knows to read to do it, or is it worth it to do it anyhow and read the parts to her, then revisit the activity when she knows how to read? My kids were 4 and 5 when we did our leaf unit, and neither of them knew how to read at that time. When we did the activities I would help by reading the labels for them. For the leaf parts activity with the labels, I would point to a part on the leaf and tell my son what it was called, and he could identify the label based on the initial sound of the word. In that way, I added a literacy dimension to the activity as well. Of course, with an older child that knows how to read you could adjust the level of help you provide. But to answer your question, no, I do not think children need to know how to read to do these activities if there is an adult who can assist them. Even before they learn to read they can develop the vocabulary to talk about the parts of the leaves, they can look at pictures showing the shapes of the leaves, etc. Thanks for the insight! I think that’s a great explanation and I think it makes sense; I did do some plant life cycle activities with labels last year, even though she didn’t know how to read yet. We will give these activities a try next week! Thank you for all your great content!